The hoof form has not come about by accident, all the different bits of anatomy work together to form a cohesive functioning whole. If one bit is not functioning correctly, this can cause strain on other areas. This strain may lead on to some of the well known hoof problems such as Navicular Syndrome, White Line Disease and Laminitis to name a few. Protection – protects the new soft outer wall as it grows. Contrary to popular belief, the periople does not cover the entire surface of the outer wall, just the top couple of centimetres (depending on the size of the hoof) and looks similar to the cuticle on our own finger nails. Flexibility – the outer wall is thicker at the toe than the quarter, this is due to increased pressure at the toe area compared with the quarters, the quarters being thinner allow more flexibility of the hoof. There is also a theory that the whole hoof capsule works like a leaf spring from a car – these springs are always thicker in the middle than at the ends – the toe of the hoof is like the middle of the spring. Rigidity – the hoof wall prevents the foot from over flexing when stepping on uneven ground. Energy Saving – It has been suggested that the springiness of the hoof capsule returning to its normal shape helps to drive the hoof off the ground during the lift off phase of the stride. Protection – for the internal structures. Shock Absorption – the tubules (thin strands like hair that form the structure of the hoof wall)of the wall are aligned in the direction of growth which provides greater shock absorption to the hoof – if they were vertical the shock would be dissipated straight up the leg, but because the tubules are at an angle and then that angle becomes less steep during a heel first landing, the shock is dissipated diagonally instead of straight up. Weight bearing – indirect through the bond with inner wall. Weight distribution – through the bond with inner wall the outer wall dissipates the horses’ weight over a greater area. Flexibility – The inner wall is pliable which allows the outer wall to flex while the pedal bone remains rigid, without this the foot would fall apart. The inner wall is less dense than the outer wall and is made from a different mix of materials, this is what makes the inner wall more flexible and gives it a higher moisture content than the outer wall. Flexibility – Even more flexible than the inner wall. The white line allows the flexible almost vertical hoof capsule to connect to the flexible almost horizontal sole. Without this joint, the hoof capsule would be rigid like a tin can. 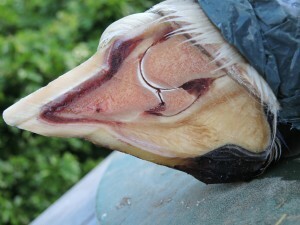 Seal – joins the sole to the wall and seals the hoof capsule. Protection – protects the internal parts of the foot from the ground – a healthy sole should be about 1cm thick. Weight Distribution – the outer perimeter of the sole should be weight bearing. The sole at the toe should bear slightly more weight than at the quarters. The sole is supplied with blood via the circumflex artery/vein at the bottom of the pedal bone, if this gets compromised so does the sole, reducing growth and leading to thin/weak soles. Circulation – pressure into the back of the foot squeezes blood vessels in that area and pushes the blood to other areas of the hoof, the pressure varies depending on the phase of the stride. Traction – the frog is made of soft horn that is non-slip (like the pads on a cat’s paw) and the wedge shape helps arrest forward motion as it digs into soft surfaces. Flexibility of the hoof capsule – the frog allows the hoof to absorb uneven ground by allowing independent heel movement. 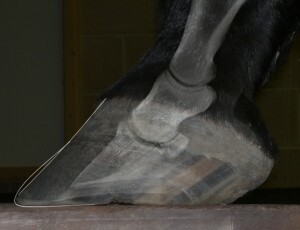 Shock Absorber – The downward motion of the bony column applies pressure to the soft structures within the hoof – these contain blood vessels which gradually get smaller – as with a car shock absorber, compression of liquid from a large tube into a smaller (narrower) tube creates resistance which absorbs impact. Support – See Internal Arch Theory below. has suggested that the frog may contain scent glands that leave a trace when the frog touches the ground, this would help the horse’s communication and suggests that scrubbing feet to get rid of the cheesy smell is counter productive. Health of the rest of foot – pressure upwards on the frog presses on the digital cushion which pushes on the lateral cartilages to help keep them strong and flexible. The bars are made of hoof wall material (outer wall, inner wall, white line but mainly inner wall) and are actually an extension of the hoof wall. Weight Distribution – the bars provide a larger surface area at the back of the foot during landing which distributes the weight right across the width of the foot (minus frog). Reinforce heel area – rather than a single point of landing, the bars help to expand the heel area (along with the angle of bar) providing a strong landing surface – a triangle rather than sharp edge so less at risk of damage. Spring – If the hoof wall is similar to a leaf spring then the bars form the ends of the spring. 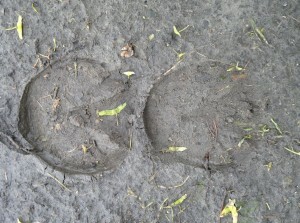 The frog pushes against these ends and flexes the hoof capsule during the stride. Flexibility – the sole, collateral grooves and frog make a “W” shape which allows for vertical adjustment of the heels and some lateral expansion of the hoof capsule. Traction – the grooves fill up with dirt, aiding traction. Flexibility – forms part of the “W” shape of the frog. Traction – may fill up with dirt depending on its depth, aiding traction. Shock Absorber – made of cartilage and the fatty digital cushion. – The whole of the outer wall and some of the inner wall grow from the bottom of the coronary groove in which the coronary band sits. Support – In KC La Pierre’s Internal Arch theory (see below) the non-elastic, extremely strong coronary band holds the components of the arch in place. Circulation – may also act as a tourniquet to stop blood entering or leaving the hoof capsule during the stance phase of the stride. During break-over blood gets released under pressure causing blood to rush back up to the heart. Shock absorption – there are lots of small blood vessels in healthy lateral cartilages; fewer in less healthy ones, however, cartilage does not normally contain blood vessels so Dr Bob Bowker’s theory is the vessels act exactly like car shock absorbers by slowing the movement of blood from one part of the foot to another. 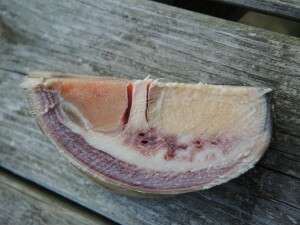 Structure – part of KCs internal arch that supports the pedal bone. Support – applies pressure to the lateral cartilages during the stride and forms part of KC’s internal arch. Shock absorption – the digital cushion sits between the frog and the deep digital flexor tendon to protect the pedal bone and tendon from the ground. 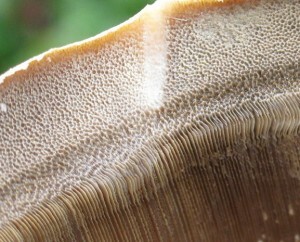 Support – The sensitive laminae grow from the outer covering of the front surface of the pedal bone. 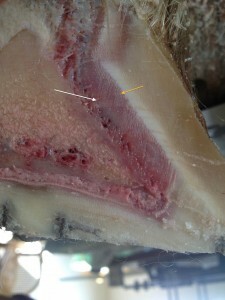 Sensitive laminae contain blood and nerves and it is these sensitive laminae that are the main structures that become damaged during a laminitis attack. 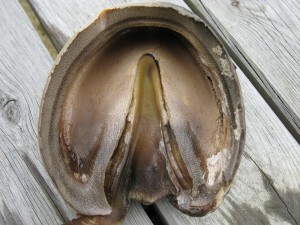 Around the sensitive laminae insensitive laminae form, the insensitive laminae are made of horn and merge into the inner wall of the hoof capsule. This attachment is incredibly strong in healthy hooves, but contrary to popular belief is not the only thing keeping the pedal bone where it should be in the foot. Flexibility – The sensitive laminae have an elastic nature and stretch and flex with every stride. The insensitive laminae are also very pliable, both work together to allow the pedal bone to move with the hoof capsule during the stride. Shock Absorption – the flexible link between hoof wall and pedal bone and the mixture of materials including blood filled vessels dissipates the shock incurred in each stride. KC La Pierre is an American barefoot trimmer and founder of the Institute of Applied Equine Podiatry. He has developed several theories around the functions of the different parts of the hoof. One of these theories, his Internal Arch Theory is very interesting in that it suggests that a number of the internal structures work together to support the pedal bone within the foot so that its solar surface sits at an angle of approximately 5° to the ground. The main structures involved are the coronary band, the lateral cartilages, the digital cushion and the frog – this theory is illustrated by dissection in that all of these structures are linked together and even if you remove the wall and sole of the hoof capsule the pedal bone remains in the correct position in a hoof that was considered healthy before dissection. You can read more about KC La Pierre’s theory here.